Until the new LG G6 and Samsung Galaxy S8 are finally released next month, the Google Pixel and Google Pixel XL are the best Android smartphones money can buy. They feature gorgeous iPhone-like styling, the latest available Android experience, cutting-edge specs, and class-leading cameras. But while they might look a bit like Apple’s iPhones, there’s one key feature from the iPhone 7 and iPhone 7 Plus that Google’s smartphone duo is sorely missing: Water-resistance. If you want to use those incredible Pixel and Pixel XL cameras underwater, you’re in luck because there’s a waterproof case on sale on Amazon right now for just $8. 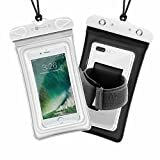 Waterproof Protection – Certification of IPX8 (20 meter underwater) Floatable TPU case with dual swivel snap and lock protect your device against water, snow, dust, sand, and dirt for beach, swimming, kayaking, snorkeling etc. 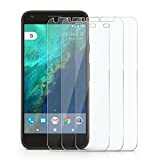 While you’re at it, snag a 3-pack of tempered glass Google Pixel XL screen protectors for just $6.99 with coupon code RI8KD6N6.